Conservation objectives - Kristen E. Dybala, Ph.D. 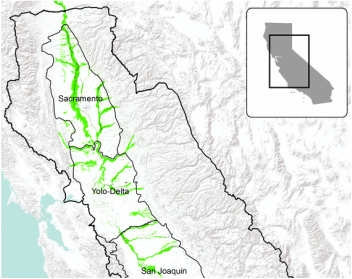 Protecting, restoring, and managing Central Valley ecosystems can increase connectivity, restore ecosystem processes, and improve ecosystem function, in turn providing habitat for wildlife and simultaneously benefiting people in the surrounding communities and beyond. Achieving these broad conservation goals requires defining specific, measurable conservation objectives, such as population size and habitat area objectives. In partnership with the Central Valley Joint Venture, a coalition of 20 state, federal, and private partners, we have worked to develop long-term conservation objectives for the Central Valley, backed up by manuscripts describing the transparent, repeatable, and science-based processes for defining these objectives to be published in a special issue of San Francisco Estuary and Watershed Sciences. Dybala KE (2018) bioenergmod: Bioenergetics modeling. Zenodo. DOI: 10.5281/zenodo.1186370. Current version available from: http://www.github.com/kdybala/bioenergmod.